Thank you for your interest in Wholesale Warranties. We are happy to hear that you want to protect the investment you have made in your Home-on-Wheels! We offer Extended Warranty coverage for all RV’s, so whether it’s your motorhome, pop-up, 5th wheel, or travel trailer, we’ve got a plan to suit your needs. Recreational vehicles are complex machines with many parts, and you owe it to your rig and your wallet to keep those parts covered. Taking on the risk of high repair costs can be an unfortunate twist in your RV journey, but an RV Extended Warranty can help to erase those undesirable, and unexpected costs. 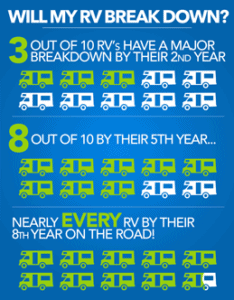 The truth is, RV’s have a very high chance of breakdown, and there’s no more stressful situation than having your vacation or road trip interrupted by mechanical repairs. We are a small company based in San Diego, with a team that will meet your needs quickly and thoroughly. Our commitment to customer service excellence has led to our A+ rating on BBB and 5-Star rating on CustomerLobby. As a broker, we are able to offer top RV Warranty programs without any bias to a given provider. We are dedicated to only offering RV Warranty Policies that have proven positive customer service, affordable pricing, and guaranteed coverage. Owning an RV can already be a lot of work, so let us take the stress out finding the right RV Extended Warranty coverage for your vehicle. Simply fill out our online quote form below with your rig’s information, and one of our knowledgeable Warranty Specialists will reach out to you in no time with your extended warranty quote.